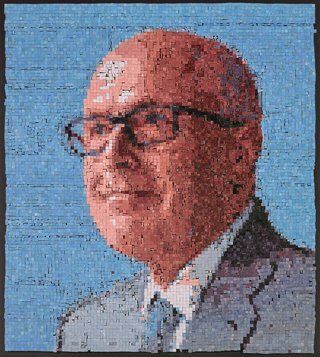 The boys of Sydney Grammar Edgecliff Preparatory School have made a joint artwork of their headmaster using thousands of tiny painted wooden squares. Notice how the squares looks like the pixels that make up a digital image, or the tiles of a mosaic. 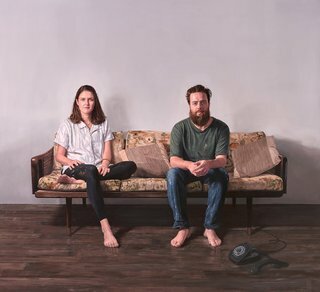 How does the portrait change when you step further back? Draw a picture of yourself by drawing a grid and shading in the squares with your pencil. At home create a collage artwork by cutting and pasting lots of little squares of paper in different colours to create a face. 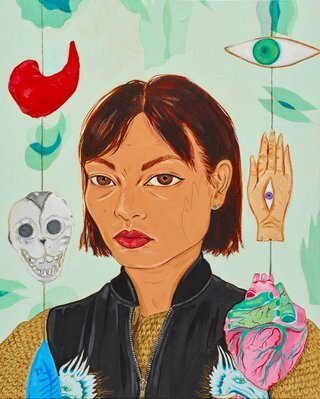 Kate Beynon has painted a self-portrait inspired by the artist Frida Kahlo and has surrounded herself with hanging symbols and objects. Each object has a special meaning that relates to luck, life, identity and hope. Spot the shadows of the objects in the background. What is unusual about them? Draw a picture of yourself surrounded by objects that you consider lucky or important. At home make a mobile of hanging shapes and objects that tell a story of who you are and the things you love. Jonathan Dalton has painted his artist friends Lottie and James sitting quietly on a sofa. Notice the floorboards and bare wall behind them, which makes them appear as if they are on stage about to perform. Imagine if Lottie and James were sitting somewhere else. Where would you place them? Draw a new environment for them. At home sketch or design a stage set with a sofa as the main prop in the centre and invent a story. 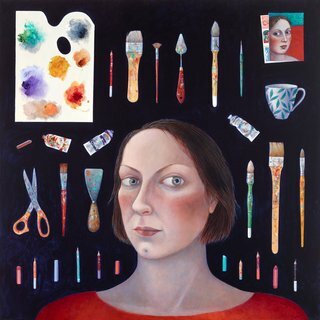 Madeleine Winch has painted a self-portrait surrounded by her art materials, all lined up in neat rows. How many objects can you recognise? What do you think she uses the cup for? What type of objects do you use to make art? Create a pattern by drawing your art materials. At home take photos of everyday objects lined up or scattered to make different patterns. 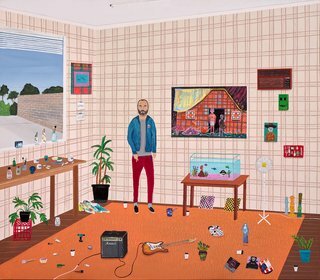 Marc Etherington has painted the artist Paul Williams standing in his art studio. Spot the fish tank at the back of the studio and the types of objects and fish inside it. Design a new fish tank for Paul’s fish to swim in. At home draw a picture of yourself in your bedroom surrounded by the things you love. 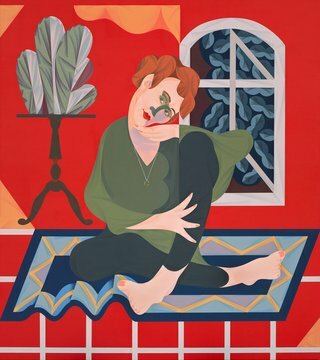 Mitch Cairns has painted a picture of his partner Agatha Gothe-Snape using simple shapes, colours and patterns. Spot the lines and shapes of Agatha’s body. Can you see similar lines and shapes in the background? Pose like Agatha. Is it a comfy position to hold while someone paints you? Draw a picture of someone and surround them with patterns, lines and shapes. At home experiment with colours and shapes to create a patterned portrait of someone sitting down. 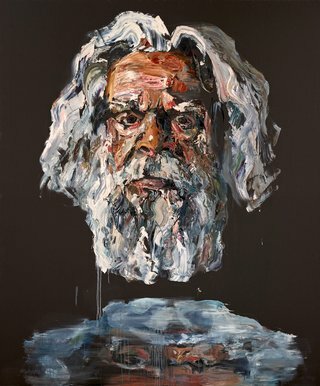 Ahn Do has painted a large portrait of the actor Jack Charles. He has created mountains and valleys from the thick paint so Jack’s face has the qualities of a landscape. Imagine you could shrink down and explore the mountainous nooks and crannies of his face and beard. What unusual things might you meet? Invent a story about your adventure and write or draw it. At home experiment with thick paint and stuck-on images to create a portrait of someone you admire.